This is Pastor Stanley Woodward writing to you from Amazing Grace Christian Church (AGCC) in Nuevo Vallarta, Riviera Nayarit, Mexico. 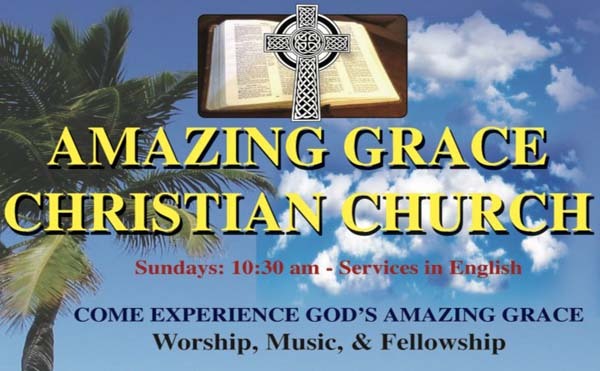 I am excited to inform you that AGCC is starting its fourth year of operation, and we continue to have our Christian church service in English every Sunday at 10:30 am. Please note that AGCC has moved to a new location at Ocean Terrace Condominiums on Paseo Cocoteros between Luma and Bahia del Sol. The service is located in the smaller building in front of Ocean Terrace on Paseo Cocoteros. The same name appears on the front of the building. So we now invite you to come and join us and worship with us in this convenient centrally located beautiful facility. We have continued without interruption our mission efforts in Colonia Magisterio and Bosques de Progreso. We hold weekly Christian church services in Progreso for adults and children in Spanish with the assistance of local Pastor Antonio and his family. As we mentioned, in January 2014 we formed a government authorized foundation called Fundacion Amazing Grace Missions, AC. This entity assists with food, clothing, training, English classes, vocational training, school assistance, and medical assistance to a growing group of families. Any donations that you might consider of food, clothing, Spanish / English Bibles, school supplies, and financial resources are greatly appreciated. We hope you can join us this Sunday Nov 16 at 10:30 am. This Sunday's message is an important and powerful message as it relates to God's provision for each of us.